As an OASIS administrator, your OASIS home screen will display the number of pending evaluations you need to complete under the My Evaluations tab. To view that list of pending evaluations, click the link under the My Evaluations tab that indicates the number of pending evaluations. After clicking on that link, you'll be taken to the list of evaluations you need to complete. Please note that users who are only using OASIS to complete evaluations will be taken straight to this list upon logging in. The evaluation list contains important information about each evaluation you need to complete, such as the name of the student being evaluated, the evaluation period, and the deadline for completing the evaluation. 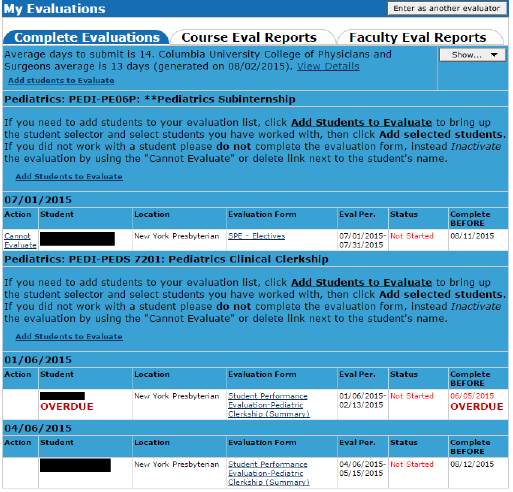 To access the evaluation for a given student, click on the name of the evaluation next to that student's name in the Evaluation Form column. If you have not completed an evaluation before its "Complete Before" date, it will be marked with a red OVERDUE. If you feel that you are unable to complete a student's evaluation (most commonly due to a lack of meaningful interactions with that student), click the Cannot Evaluate next to that student's name. You'll be asked to detail the reason why you feel you are unable to complete this student's evaluation.